In 2011, the Central Intelligence Agency released our government’s six oldest classified documents, dating to the days of World War One. These documents originally were used by spies, military, and government officials during that war. One of these documents contains a recipe for making invisible ink. This clandestine information was instrumental to the Allied effort of the First World War. It had been kept secure for nearly a century until technological advancements made the information obsolete. This information became available through the Freedom of Information Act (FOIA) and is accessible to the general public at the CIA’s website. 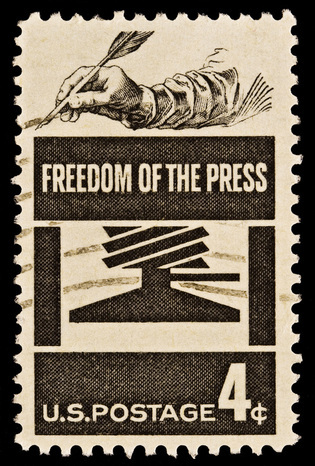 The Freedom of Information Act was signed into law on July 4, 1966 by a reluctant President Lyndon B. Johnson. It began its journey to legalization with the proposal in the House of Representatives by Representative John Moss of California and in the Senate by Senator Edward V. Long of Missouri. Johnson was concerned about how the law might hinder presidential powers, especially with the escalating war in Vietnam. Moss and Long were determined to see the law passed. They believed that citizens had a right to know information from the government. Missouri continues to be instrumental in such efforts concerning the freedom of information for citizens. The National Freedom of Information Coalition is located today in Columbia Missouri, fighting for the\rights of citizens, the freedom of the press and freedom of speech. These freedoms were established in the first amendment to the United States Constitution. In the Preamble of the Constitution, the Founders established the desire to protect individual rights and provide for the safety and well-being of the citizens. They saw these things as integral purposes for a government to maintain. Some believed that there must be some written declaration of individual freedoms, a Bill of Rights, included in the Constitution to detail the limits to national government power over the people. Many of the state constitutions already had Bills of Rights, a listing of the civil liberties, or freedoms we have to think and act without government interference or fear of unfair treatment. Still, these individuals demanded for such a list to be part of the Constitution before they would accept it. The Bill of Rights was added to the Constitution in 1791, with 10 amendments detailing these rights. 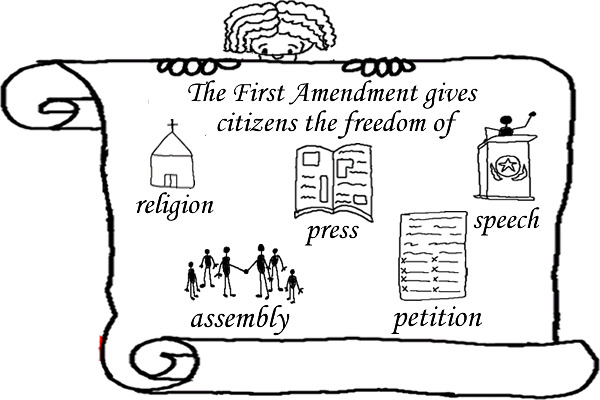 The First Amendment protects five basic freedoms: freedom of religion, freedom of speech, freedom of the press, freedom of assembly, and freedom to petition the government. These civil liberties establish the foundation of our democracy and what we can do as citizens of the State. They express the ability to develop our own beliefs, express ourselves freely, meet openly with others, and have our view on public matters heard by those who govern. Many early colonists suffered discrimination and frustration in Great Britain. There was an official religion, the Anglican Church, in the land and it was difficult to believe otherwise. These problems led many to come to America in the first place. 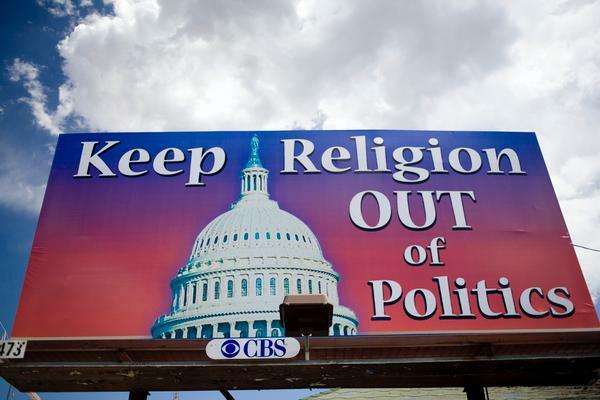 With the First Amendment, the Constitution prohibits Congress from creating an official religion in the United States. Citizens have the freedom to practice or not practice religious beliefs as they wish. There must be no favoritism shown by the government for any one religion. Suppose you didn’t agree with the government on a certain issue? What if you called in to a radio talk show and complained? In some countries, that could cause you to be put in jail. In the United States we have the First Amendment guarantee to be able to speak your mind, in public or private, without the fear of punishment by the government. Face-to-face discussions, telephone conversations, lectures, and radio and television broadcasts are covered by the guarantee of free speech. Other forms of expression are also covered by this freedom. 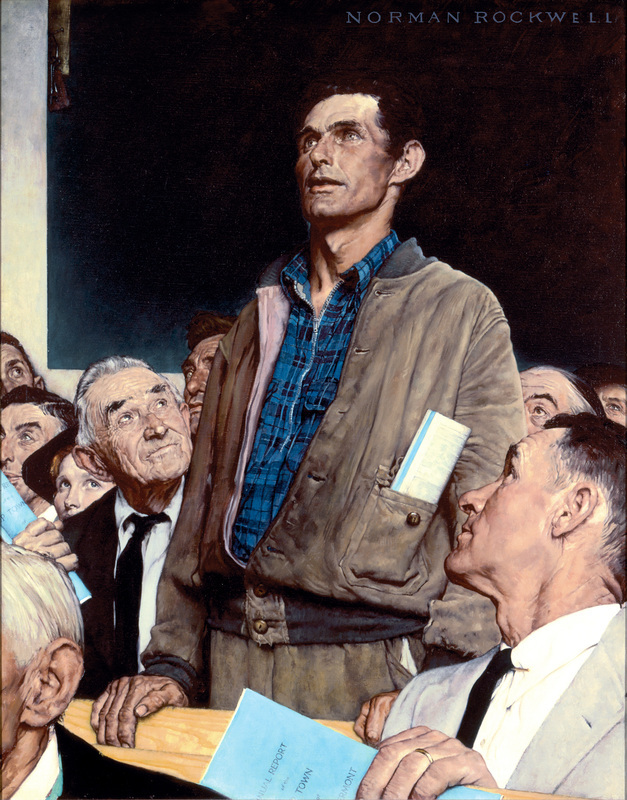 The Supreme Court says that “speech” can be also in the form of Internet communication, art, music, or even clothing. While the government may not agree with the expression and it may upset members of the community, it is still covered by the First Amendment. Some people have expressed their views and opinions toward religion and other tenets of society in ways deemed inappropriate by the majority. But because of the First Amendment, these expressions often have been allowed to some degree. 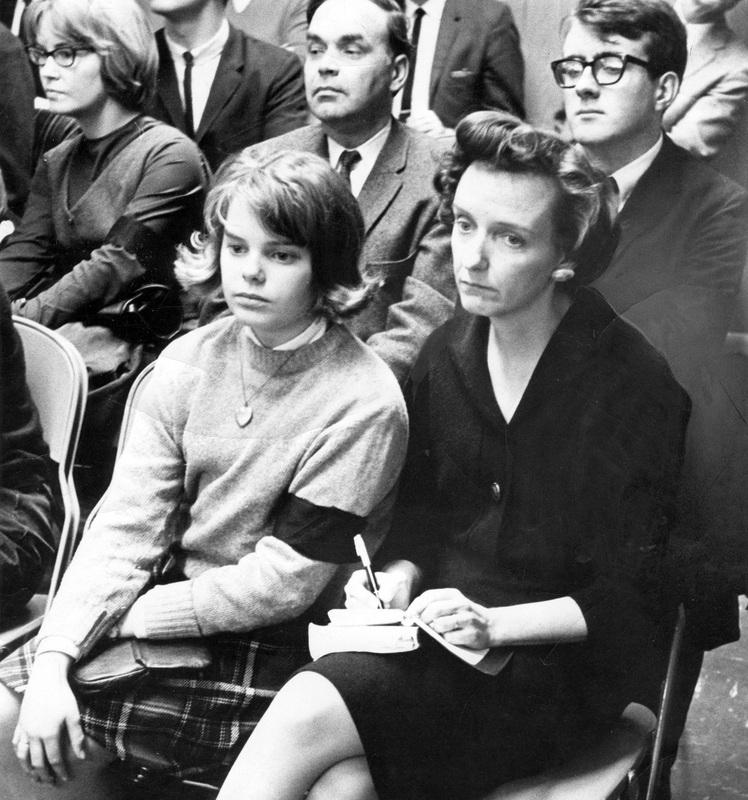 In 1965, brother and sister, Mary Beth and John Tinker, with two other students came to school wearing black armbands to mourn the deaths in the Vietnam War. The school quickly suspended them for the armbands as they said they were preventing “disturbing influences.” These children of a Methodist minister would eventually take their case to the Supreme Court, claiming that their First Amendment free speech rights had been violated. The court ruled in 1969 that the armbands were an example of free speech protected by the First Amendment. The decision was not unanimous, two justices voted against the Tinkers. One claimed that no one had a complete right to freedom of speech and expression. Still, the consensus, or the majority opinion of the court was that the students’ action was “akin to pure speech” even without a word spoken. The Supreme Court said that the action deserved protection under the First Amendment. 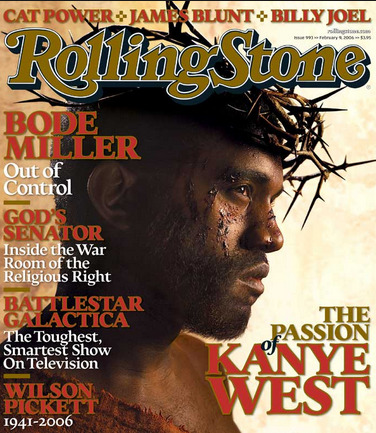 We can express ourselves in print as well as in speech thanks to the First Amendment. Initially, this meant any printed publications, such as books, newspapers, and magazines. Technology has led to the addition of radio, television, and computer networks to this list. Some forms of media are pro-Republican while others might be pro-Democrat in their coverage of politics. Some may be liberal and others conservative. Some might have a rural approach and others more urban. We receive exposure to many varied viewpoints, more so now with the Internet. The government cannot censor, or ban printed materials or films simply because of their content. It also cannot censor information before it is published or broadcast. If you wanted to gather with fifteen of your closest friends outside of the school on the city sidewalk, it would be possible as long as you didn’t restrict people from using the facility. The First Amendment protects our right to gather in groups for any reason, as long as it is peaceful. We can attend meetings, parades, political rallies, and public celebrations. The location and the time of such meetings may be restricted, but the event cannot be prevented. 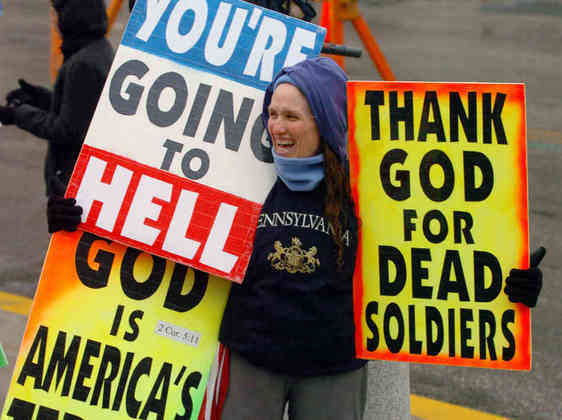 Recent years have brought to our attention the Westboro Baptist Church, protesting at funerals of soldiers. This group will travel the country to stage their activities, standing near the funeral with signs of hate language. Many people get upset because of what the signs say and the fact that these people are infringing on the recognition of their loved one. Some have taken the group to court in attempts to prevent their protest, but the Supreme Court has ruled that they have the right to assemble through the First Amendment. Restrictions have been placed on the assembly, such as how close to the actual funeral the group can assemble, but they are still allowed to assemble in a peaceful manner. The Supreme Court has decided that the freedom of assembly implies freedom of association. Thus the First Amendment also protects our right to form and join social clubs, political parties, labor unions, and other organizations. Even if we never assemble with fellow members, we have the right to belong to such groups. Groups, such as the American Nazi Party, Ku Klux Klan, etc. all have the right to assemble and form as long as they follow the guidelines established by the government. The First Amendment guarantees all Americans the right to petition the government. A petition is simply a formal request. To petition means to ask for something, a signed list of names on a written petition is a declaration of request for something to be done. This freedom gives American citizens the right to request something from our central government. Even a simple letter or e-mail written by an individual, however could be considered a petition. The right to petition means the right to express one’s ideas to the government. If you want to complain about poor school lunches or dangerous roads near a playground, you can write to your elected representatives. If enough people express similar views, government leaders may take action. The Supreme Court has decided that compelling public interests, the safety and security of Americans, may justify limitations on our First Amendment freedoms. Freedom of speech does not include the right to jeopardize the government or other Americans. You do not have freedom to start a riot or other violent act. You are not free to speak or write in a way that immediately leads to criminal activities or efforts to overthrow the government by force. Citizens should use their civil liberties responsibly; they should not interfere with the rights of others. You are free to talk with others friends on the street, but you cannot block traffic. You may campaign for causes, but you may not spread lies that harm a person’s reputation. Spreading uch lies is a crime called “slander” if the lies are spoken and libel if they are printed. 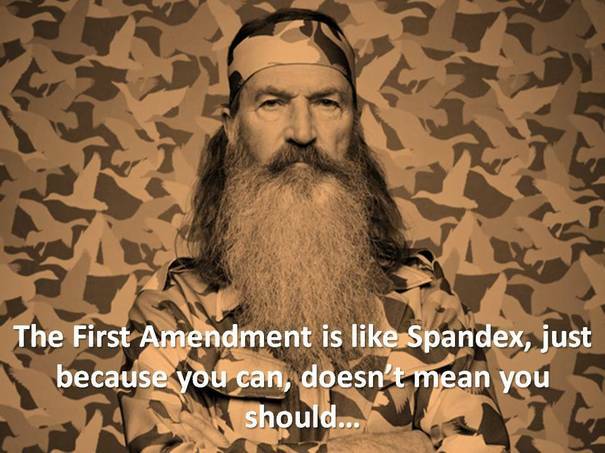 The First Amendment was never intended to allow Americans to do whatever they please. Unlimited freedom is not possible in a society of many people. The rights on one individual must be balanced against the rights of others and against the rights of the community. When there is a conflict, the rights of the community often come first. Otherwise, the society would break apart. Remy, Richard (2012). “Glencoe: Civics Today.” Glencoe.